U.S. Bureau of Land Management - FTS Inc.
An agency within the United States Department of the Interior that manages approximately 245 million acres of public land located primarily in the 11 Western States and Alaska. 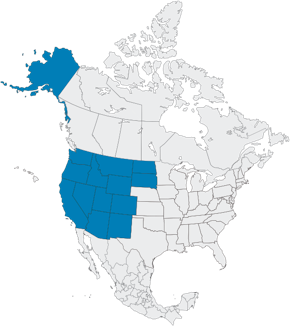 BLM territory covers the majority of the western United States and is characterized by precipitous mountain ranges, desert valleys, luscious coastal forests, and glacial ice fields in the far north. This area encompasses many extremes, having both the lowest (Death Valley) and the highest points (Mt. McKinley) in North America. BLM territory stretches from the Pacific Coast, through the Rocky Mountain Ranges, and all the way to the borders of the Great Plains. The climate in this region varies from Mediterranean along the western coast, to dry and arid in the Great Basin region, to subarctic in the Alaska region. Winters in the northwestern interior states can be quite harsh, and summers are generally quite warm for the entire region, with temperatures around 30°C. The U.S. Bureau of Land Management has been an FTS customer since 2000. 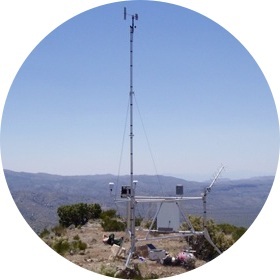 The Bureau of Land Management RAWS network is used primarily for fire weather monitoring as well as controlling prescribed burnings. The network consists of both fixed and portable stations..